Whenever friends heard I was sailing in the North Channel, they imagined the North Sea, NE of Great Britain and South of Norway, cold and dangerous. Whenever I told friends I stopped in Thessalon during my cruise, they assumed I was in the Greek Islands. So, where the heck are we? The body of water that runs from the NE area of Georgian Bay almost to Sault Ste Marie, north of Manitoulin Island (the largest freshwater island in Ontario, Canada and the world) is called the North Channel. One of the cities on the mainland between Sault Ste. Marie and Blind River is Thessalon, which is where we have been doing a major repair to our engine. 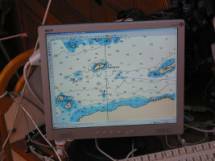 The photo sequence shows us closed hauled at 18 knots of wind, how the computer navigation program sees the world and how the island we are passing really looks. § Met interesting people, like the school teacher and his family who regularly go to Costa Rica to supply solar panels and LED cluster lights to poor rural villages, part of the “Light Up the World” campaign at the University of Calgary. § Met some interesting critters ... some we entertained others we swatted. § Replaced the exhaust riser pipe on the engine with the help of Harold and George, two very helpful GLCC members that carry pipe wrenches as part of their basic tool kit ... Harold is standing, George is swinging and Brian is on his knees. Brian waited until the worst of the noxious fumes had cleared from the engine room, and then began removing the insulation covering to reveal the exhaust riser pipe with major damage. Brian began rummaging about for stuff he could use to fix the problem: wire, hose clamps, muffler tape and the artichoke can from last night’s dinner. 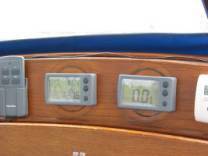 Since we were anchored right in the middle of the channel into the anchorage, I kept a lookout for boats and monitored the radio. In a relatively short 90 minutes, Brian said his jerry rig fix was finished. I let Brian wipe his brow and catch his breath, then we discussed options for the day. We decided to motor back to the anchorage so that we could test the jerry rig fix and determine if it was OK to get us to a port where a permanent fix could be made. The jerry rig was not good enough. The aluminum can was replaced with metal epoxy and additional wire supports were added. The next day, we left Turnbull Island at 7:00, using the motor just long enough to get the sails up. We sailed the entire 35 nautical miles to Thessalon, sometimes with no wind, and in the afternoon with 18 knots (40 KPH) wind, right on the nose, requiring us to tack (zigzag rather than straight line course) the last half of the trip. We arrived in Thessalon at 1900 (7 PM). Thessalon is a small village with a hardware store and machine shop. Over the past two days we have been able to buy new pipe and fittings to rebuild the entire riser once we had recovered one undamaged part from the old exhaust. The North Channel has been a favorite cruising ground for US and Canadian boaters since the 1940’s. Although there is little commerce and industry in the area now, this has not been the case in the past. Humans lived in the area as long as 9000 years ago (the Plano). The First Nations people associated with the area are the Ojibwe (Chippawa in the US), Odawa (or Ottawa) and Potawatoni, all part of the Algonquin linguistic tradition. There are currently reserves for First Nations people on both Manitoulin Island and the North Shore. Europeans arrived in the early 1600’s and realized the wealth of natural resources they could exploit. Traders from New France began a keen competition for fur pelts from the First Nations. The French made alliances with the Huron (in the southern Georgian Bay area) and Odawa. The British, not to be outdone, allied with the Iroquois and Ojibwe and by 1640 the Iroquois Wars had begun; they continued until 1701. Epidemics (such as smallpox) and wars weakened all the First Nations communities. In 1670 the newly formed Hudsons Bay Company build forts in the area and the French retaliated by building their forts. Competition between the British and French trading companies was fierce until the mid 1800’s. The First Nations population suffered; they lost traditional skills and were forced to depend on traders for goods. Liquor became the currency of choice. First Nations were forced to sign treaties giving up great resources of land, setting up reserves and setting up hunting and fishing rights. The last half of the 1800’s saw accelerated settlement and industry introduced. Logging was the first major industry and there are many harbours in the North Channel today that bear remains of logging camps. In almost every anchorage cruisers must be on the lookout for “deadheads,” logs that are water-logged and either have a tip of a head showing or are submerged a few feet below the surface of the water. They are usually vertically free-floating, but may have one end submerged in the mud bottom. Pilings, cribs, iron rings in the rock-face and some building remains can be found in some harbours. Fishing also became a major industry hitting its peak in the 1890’s. The major catches were whitefish, herring (smelt) and pickerel. Some net fishing is still done today by First Nations people, and within the past 10 years, fish farms are being developed in many areas. With the construction of the first lock in the St. Mary’s River (1850’s) linking Lake Superior with the other Great Lakes, shipping became an important industry. Because roads were poor and bridges non-existent, both passenger and provisioning boats ran back and forth to serve new lumber camps, fishing centres and the emerging mining camps (copper, nickel). By the 1880’s passenger excursion boats were popular, bringing city folk to the cooler (and buggier) northern climate before the days of air conditioning. With increases in shipping, collisions also increased and a number of shipwrecks are still underwater today. The increased traffic also brought a need to construct lighthouses and other aids to navigation. By the 20th century, much of the logging, mining and shipping through the North Channel tapered off. 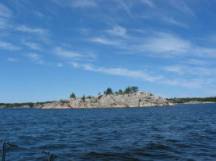 Since the mid-1940’s the area is increasingly used by cruisers and cottagers. The mining of limestone was begun in the late 20th century on Badgley Island. First Nations, environmentalists and cruisers successfully stopped a major mining operation in Baie Fine in the 1980’s and 1990’s. It is amazing how little the environment has changed since Jane’s first cruise aboard Allegro (a 44-foot wooden schooner) in 1960 and Brian’s and Jane’s cruises together in the last 1980’s.